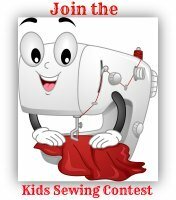 Felt organizer for kids sewing projects-Level 2- learning to sew on the machine. 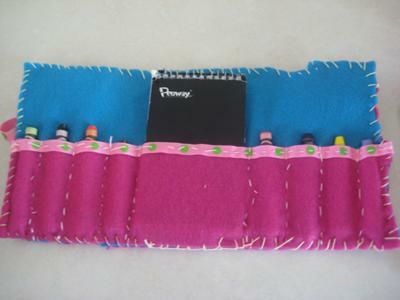 This Felt Organizer is so versatile that you can use it to store pencils, markers, paintbrushes or use it as a sewing case. 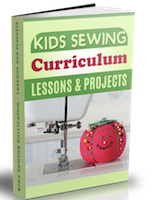 However you use it, it is an easy beginner sewing project. Fold bottom end of the felt up 4 inches. Pin in place. Stitch along each side. With a measuring tape place a pin every 2 inches. Make pockets by stitching down the center where each pin is. Don't forget to backstitch at the beginning and end. Fold your ribbon in half and pin the center to one side. Stitch the ribbon in place. Fold up and tie in front. You can also decorate the front by gluing pieces cut out of felt, ribbon or add beads to your ribbon. 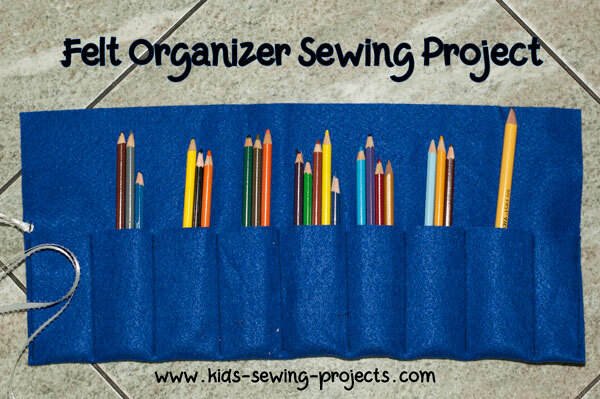 This simple and useful felt organizer project uses three different hand sewing stitches. And with the freedom to design your own color scheme and appliqué design each project is charming and unique. 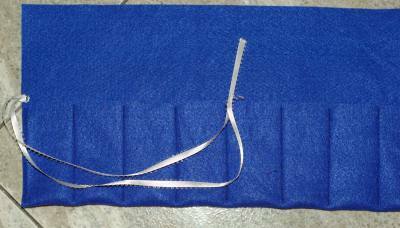 With a running stitch sew one of the 13" lengths of ribbon to the top edge of the pocket. Mark sewing lines for crayon pockets about an inch apart with a 3 1/4" pocket in the middle for the notepad. 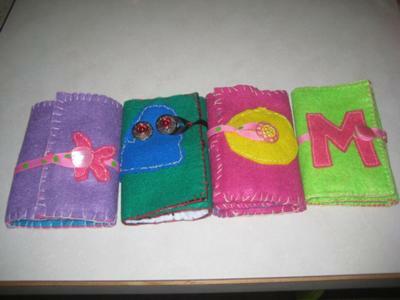 With a running stitch sew the crayon/notepad pockets to the inside piece of felt. 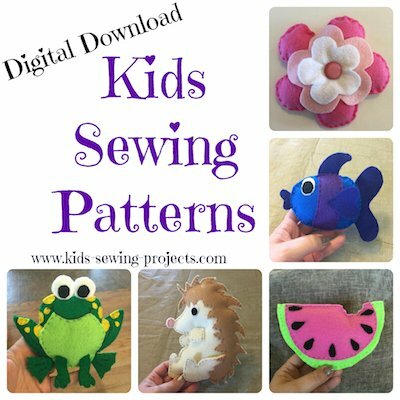 Create appliqué design for outside with felt pieces. Pin appliqué design to the outside piece of felt and tuck the second 13" ribbon underneath. This ribbon will wrap around the holder to the button to keep it closed. With a back stitch sew appliqué design and ribbon to the outside piece of felt. Sew button to the outside piece. With a whip stitch or blanket stitch attach the outside to the inside/pocket. 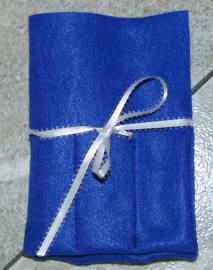 Make sure to fold the ends of the ribbon on the pocket in between the outside and inside pieces to hide the edges and make it look nice. Fill crayon holder with crayons and notepad. Measure outside ribbon around the holder to the button. Sew a loop in the ribbon so it can hook around the button. Trim ribbon end and finish with fray check or paint with clear nail polish so it doesn't fray. Back to Pre-Beginner sewing from Felt Organizer.